Home / Flyer / The Empire Strikes Back! What could be hotter than a new Star Wars movie? 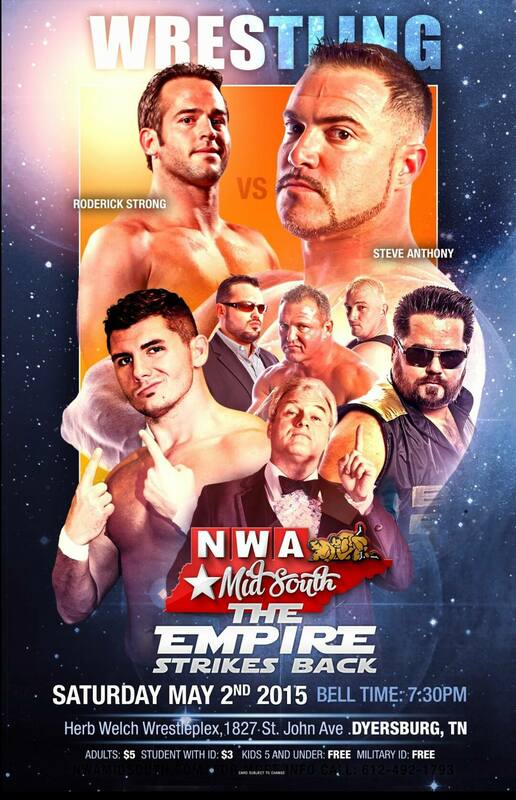 Find out Saturday Night in Dyersburg, TN! 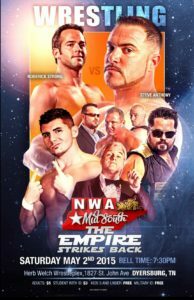 No other wrestling company in the entire tristate area brings you the quality of wrestling matches or wrestlers that will be featured at ‪#‎TheEmpireStrikesBack‬ Supercard THIS COMING SATURDAY NIGHT, May 2nd in Dyersburg, TN @‪#‎TheHerbWelchWrestlePlex‬! We’re located at 1827 St. John Ave! Jason “The Gift” Kincaid is the best ‪#‎IndyWrestling‬ star in the business AND this coming Saturday night at ‪#‎TheEmpireStrikesBack‬ Supercard on May 2nd, he will showcase his many in ring gifts in a match against the self proclaimed ‪#‎BestOfTheBest‬ – @NWAGoldenBoy Greg Anthony! THIS SATURDAY NIGHT, May 2nd – “Loverboy” Matt Riviera, accompanied by the ‪#‎legendary‬ manager of the ‪#‎FourHorsemen‬ & ‪#‎RicFlair‬ – JJ Dillon, defends his coveted ‪#‎NWAWesternStatesHeritageTitle‬ against the “Southern Sycho” Elliott Russell at ‪#‎TheEmpireStrikesBack‬ Supercard! Bell at ‪#‎TheHerbWelchWrestlePlex‬ is 7:30pm & it’s located at 1827 St. John Ave in Dyersburg, TN! At ‪#‎TheEmpireStrikesBack‬ Supercard THIS COMING SATURDAY NIGHT, May 2nd, The “Master of the Backbreaker” Roderick Strong faces “The Exclamation Point” of the ‪#‎Empire‬, Steve Anthony in a can’t miss ‪#‎MainEvent‬!